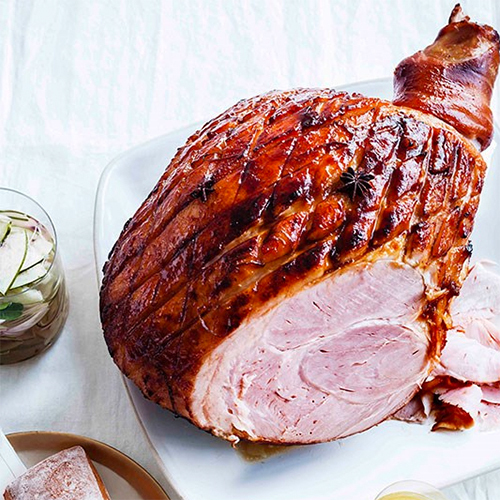 Most Christmas tables will feature a ham, but let’s face it, when combined with Turkey, Pork and all the trimmings it can be a little to much. 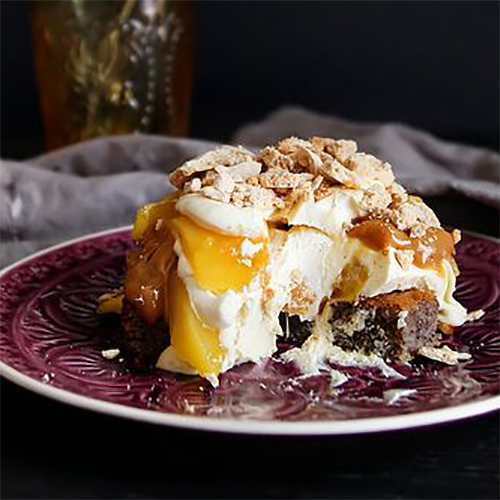 We came across this recipe on Gourmet Traveller and tried a ‘scaled down’ version it last weekend. The asian flavours of this glaze match perfectly with the pickles that also cut through the richness of the other meats and trimmings – It’s a match made in heaven! For pickled watermelon rind, bring vinegar, sugar, coriander seeds, 100ml water and a pinch of salt to the simmer in a saucepan over medium heat, stir to dissolve sugar (5-7 minutes) and set aside to cool (30 minutes). Add watermelon rind, shallot and chilli and refrigerate to pickle (overnight-48 hours). Preheat oven to 180C. Combine pineapple juice, sugar, ginger, cloves, star anise, chilli and lime rind in a small saucepan over medium heat, stir to dissolve sugar and simmer until reduced by half (15-20 minutes). Remove from heat, add half the lime juice and set aside. 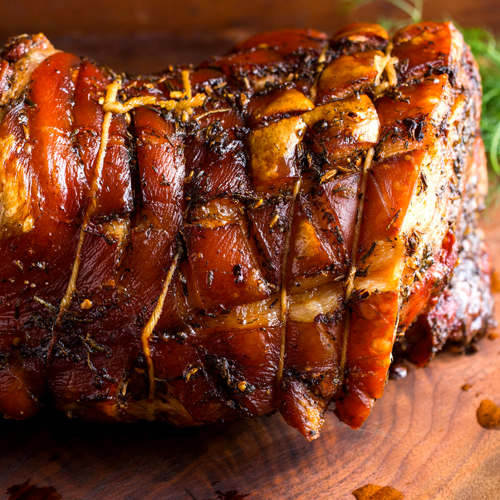 Place ham in a large roasting pan, brush with pineapple glaze and roast, basting occasionally, until ham is caramelised and warmed through (1¼-1½ hours). Season to taste with remaining lime juice, slice and serve with pickled watermelon rind. You need to start this the day before you cook it, but the end result is well worth the effort. The combination of Fresh and Dried Fennel (seeds) really impart a flavour that has to be tried to be understood and the pan juices? Amazing – Only matched by the crispiest crackling you’re likely to taste! Turn over and season the flesh with two handfuls of sea salt flakes and a generous amount of freshly ground pepper. Dot the 10 garlic cloves on the flesh, pushing them into the flesh where possible. Sprinkle all over with fennel seeds, dried chilli flakes and fennel fronds (in that order). Gently and tightly re-roll the shoulder (noting that it will be harder to roll with the filling) and tie with butchers twine (or re-use the elastic twine if your pork came with it). Place on a rack, lightly cover with cling film, and place in your fridge overnight. Remove the pork from the fridge two hours before you want to cook. 30 minutes before your pork goes into the oven, preheat it to 220 c.
Drizzle the olive oil on the pork 1 tablespoon at a time and massage it into the scoring. Then, taking 2-3 generous handfuls of sea salt flakes and press it into the rind ensuring you have a visible layer of salt on the rind. Ensure you have a roasting tray with a roasting rack large enough for your pork. Cut your fennel branches in half, then lay them on the roasting rack making a bed for your pork, and transfer the pork to the tray. Into the bottom of the tray pour 2 cups wine and 1 cup water. Place in the oven and bake at 220° for 20 minutes, then turn down the oven to 180° and roast for 40 minutes per kilogram - turning it around every hour or so and adding the remaining wine and water halfway through. Remove from oven and transfer the pork to a large board. Cover with aluminium foil and rest for 30 minutes before serving. To serve, remove the crackling, breaking it up into pieces. Slice the pork in large rounds and serve with the pan juices. We all love Mango and you’ll we think the fruit in our produce department is some of the best you will find – Perfect for this recipe which combines Mango, Pineapple and Asian flavours with, wait for it – beer! What could be better? It’s the perfect light and refreshing finish to a festive meal and really is Summer on a plate! For amber ale jelly, bring ale and sugar to the simmer in a saucepan over medium-high heat, stirring to dissolve sugar. Squeeze excess water from gelatine, add to pan and stir to dissolve. Strain through a fine sieve into a bowl and set aside to cool, then refrigerate until set (3-5 hours). For kaffir lime caramel, stir sugar, 200gm water and kaffir lime leaves in a saucepan over medium-high heat until sugar dissolves, then cook without stirring until caramel (5-10 minutes). Add lime juice and 1 tbsp water (be careful, hot caramel will spit) and set aside to cool. 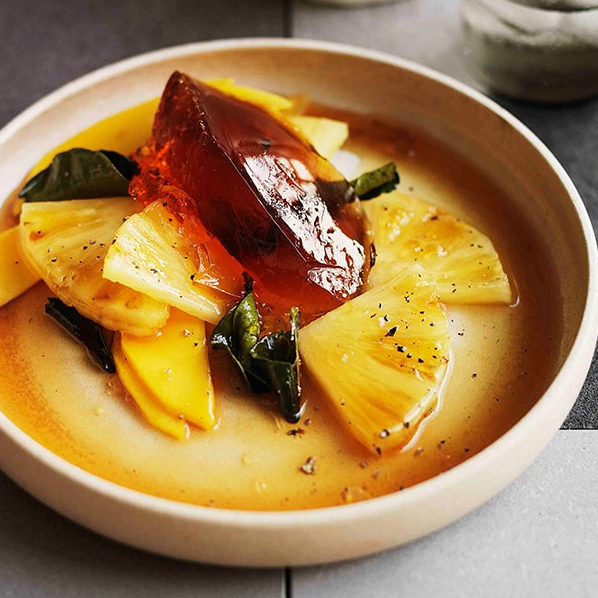 Arrange pineapple and mango among bowls, scatter with black pepper, top with spoonfuls of amber ale jelly, drizzle with kaffir lime caramel and serve with vanilla or coconut ice-cream. If you don't have titanium leaves - use 5 standard.